Sometimes when starting a new oil painting, nothing can be more intimidating than a big white blank canvas staring you down. Each paint squeezed out on your palette looking more vibrant, vivid and intimidating. If you’re the type of person who see’s that blank canvas and it terrifies you like a killer clown in white makeup, then maybe underpainting might be the answer for you! In painting, an underpainting is a first layer of paint applied to a canvas or board and it functions as a base for other layers of paint. It acts as a foundation for your painting and is a great way to start your painting off with some built in contrast and tonal values. It’s a technique that was widely used by the old masters as a way to develop a plan for future color placement and to establish certain values and tones within a painting’s color palette. 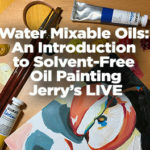 An underpainting, if used correctly, is a great way to unite color values in the overall painting and add a subjective color key to the painting that will create a tonal dominance of the painting. A blue toned underpainting can make a painting feel cold, even if something is red-like a barn in wintertime against a white, snowy backdrop. A yellow toned underpainting is great for a swamp or desert scene, because the painting will seem like it takes place in a hot climate. Some purples are great for warm layers later on, or for making shadows. 1. Tonal Grounds Under Painting- This type of painting has the entire canvas covered in a single transparent color. This layer will create backlighting shadows that will tone the entire painting and provide contrast for complimentary colors. 2.A Tonal Under-Painting- Still using just one color to cover your canvas; in a tonal under-painting, map out where you want the darker and lighter areas. In this version, you can leave certain areas unpainted to let some white canvas stick through. As you apply more colors when you start your “real” painting, the white canvas will shine through even greater and appear much brighter. 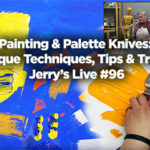 As a whole, this technique can give you brighter top colors and a head start on developing subjects in your painting. Side Note: You can also color in your areas with different local colors instead of leaving the canvas blank .This type of color blocking can make the composition seem a bit more edgy or dramatic even when you paint over it with complimentary colors later on. It will also take away that blank white canvas space. 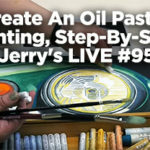 When attempting an underpainting, one of the best ways to start is by thinning your paint with a bit of turpentine which will thin the pigment and then lift off a bit and blend in with later layers of paint as you continue with your painting highlighting the underpainting and the extra work you’ve done (We suggest LUKAS Turpentine with oil paint). Other thinning mediums can help as well, but need to be applied lightly or you risk the outer layers cracking and peeling as time goes on. The paint you choose is also important in underpainting. A poor underpainting can make the overall painting muddy. A paint that mixes well and has a great high pigment load can really make a difference. 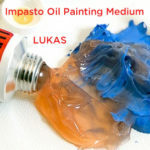 LUKAS 1862 Oil Paints are perfect for mixing and layer terrifically. 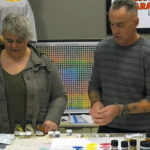 However, if you’re new to painting and are just trying things out, SoHo Urban Artist Oil Colors might fit your budget a bit better and you will still get a great quality paint for mixing and layering. Underpainting is a great way to grow as a painter and learn without having the overbearing presence of a stark white canvas in front of you making each first stroke of color seem more important and final than they really are. It can add a world of depth and value to your work that change the way you see color and tonal values.